Agricultural Economic Insights Is it time to ‘Make CRP Great Again’? Is it time to ‘Make CRP Great Again’? 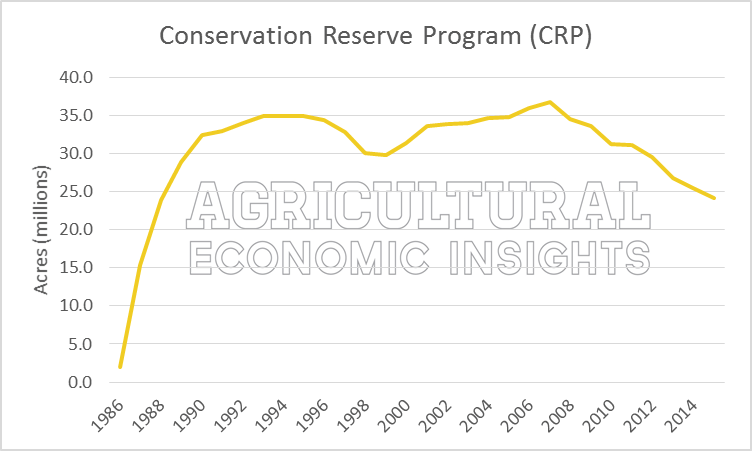 While we have covered the CRP program trend towards fewer acres in earlier posts (here and here), we continue to find the program’s contraction a bit fascinating; especially given the current financial headwinds for production agriculture. Furthermore, it seems that most are unaware of this policy trend. This week we re-visiting the CRP program and evaluating why efforts to ‘Make CRP Great Again’ may soon be underway. On the heels of the farm financial crisis of the 1980s, the U.S. government implemented a series of programs to assist producers. The CRP was born during this era as a program for planting environmentally sensitive farmland to native grasses for extended periods; often up to ten years. CRP began in 1986 (Happy 30th Birthday, CRP) and quickly exceeded 32 million acres by 1990 (figure 1). Program acres stabilized around 35 million acre until the mid-1990s. In 1996 (the time period of “Freedom to Farm”), the program contracted to roughly 30 million acres. After the 2000 Farm Bill, program acres began expanding again and peaked at 36.8 million acres in 2007. Since 2007 the CRP program has steadily contracted and in September 2015 included only 24.2 million acres. Over the last 8 years, acres in the program fell by a total of 12.6 million acres, or contracted 34% overall. In other terms, the program reduced at an average annualized rate of -5.1%. Currently, the program is at its lowest levels since the its start-up in the late 1980s. Figure 1. Acres in the CRP program (1986-2015). Data: USDA Farm Service Agency. In figure 2, a geographic look at the change in CRP acres is shown. In four states – Kansas, North Dakota, Montana, and Texas – the reduction in CRP acres exceeded 1 million acres. In Montana and North Dakota combined, CRP declined by 3.8 million acres (or 31% of the 12.6 million acres of total reduction). Not only did Montana and North Dakota have large decreases in CRP acres, the reductions were also large relative to CRP acres in those states. In both states the reduction was equal to more than 50% of the state’s CRP acres in 2007. 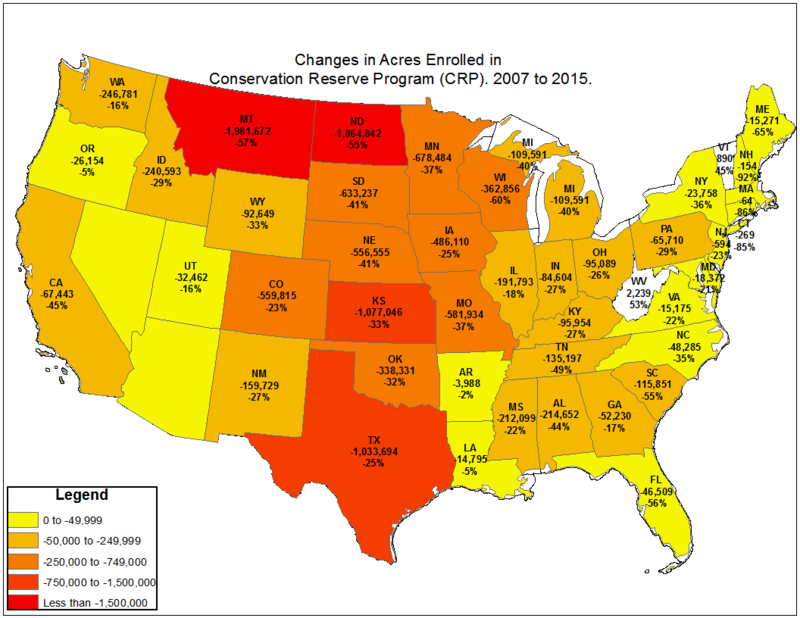 Across the Western Corn Belt and Great Plains states, CRP acreage reductions of 30 to 40% of 2007 level are very common. CRP acre reductions played an important role in the recent expansion in corn and soybean acres, especially in North Dakota and South Dakota – here and here. Figure 2. Change in CRP acres, by state, from 2007 to 2015. Third lines of data represents the percentage change in CRP acres from 2007 levels. Data: USDA Farm Service Agency. An important driver behind the decline in CRP acres was the 2014 farm bill. In the current farm bill, program acres are capped 24 million for fiscal years 2017 and 2018. The lower acreage cap was largely a cost-savings measure as the farm bill was worked out during the heat of the federal budget debates (remember the government shut-down of Fall 2013?). The previous cap was at 32 million acres. Given the long-term contractual agreement CRP establishes with producers, how aggressively Congress can reduce acres (or lower the acreage cap) is limited by how many acres are set to expire. In figure 3, program acres set to expire from 2016 to 2022 are shown. For 2016, nearly 1.7 million acres expired and 800,000 acres were enrolled, hence a net decrease of nearly 900,000 acres. As the program is currently near its 24 million acre cap, it would be surprising to see large decreases in net acres moving forward. In 2017 one could expect the USDA to announce larger acreage enrollments given the nearly 2.5 million acres set to expire. Looking beyond the current farm bill, very large reductions in program acres are possible. Between 2020 and 2022, 11.6 million acres are scheduled to expire. This is a large block of acres that, should Congress decide to further reduce the CRP cap, would make such a cut feasible. Figure 3. CRP Acres to Expire, 2016-2029. Data Source: USDA Farm Service Agency. Will CRP Be Great Again? At the farm level, the appeal of expanding CRP acres is compelling for a couple reasons. First, individual producers will evaluate their operation and determine if the cash rent offered by the program is more appealing than the current economics of producing grain. As Brent pointed out earlier, producers are struggling to earn returns to farmland equal to cash rental rates. Anecdotally, we’ve heard a lot of producers considering CRP given the attractive rental rates. Across the farm economy as a whole, additional CRP acres would also result in fewer acres in production. Fewer acres of production indirectly support overall commodity prices and, given the margin squeeze producers are facing, this could be very attractive. Criticism of this approach are that 1) the acre reduction wouldn’t be enough to matter, especially given the global nature of agriculture and 2) even if prices are supported by fewer acres of U.S. production, international agricultural producers would also benefit. These are issues that will face economic research and political debates. Not only would an expanded CRP program be appealing to agricultural producers in today’s economic environment, CRP also resonates well with wildlife and environmental interests (especially in light of recent water quality concerns in Iowa and Ohio). In short, today – as in the 1980s – CRP is likely to capture broad political appeal. For nearly a decade the CRP program has been slowly reducing acres. These acres have made their way back into production and contributed to an expanded base of U.S. acres. The reduction in program acres over the years has been quite significant. The reductions were due in part to a lack of interest from farmers – given the strong farm profits from 2009 to 2014- and budget negations in Congress. 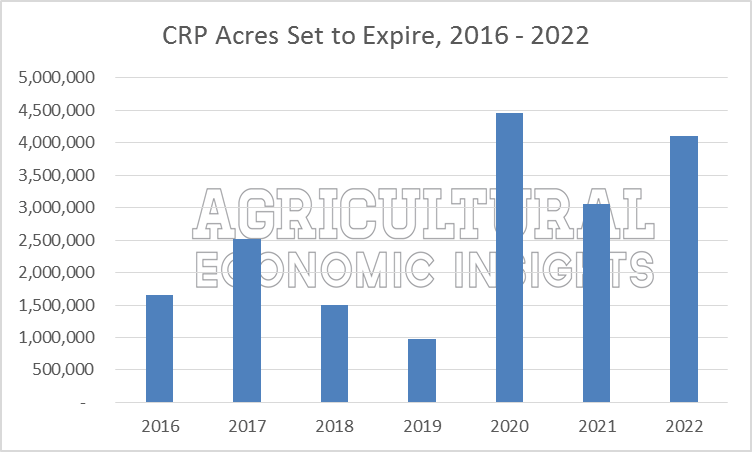 Looking ahead, the CRP program has the potential to face even sharper reductions given the acreages set to expire between 2020 and 2022 (figure 3). However, we think CRP will, again, be popular when the 2018 farm bill is negotiated. This will especially be true if farm incomes remain low and the pressure to assist farmers exists (such as it was in the 1980s). In the meantime, keep an eye out for those “Make CRP Great Again” hats.